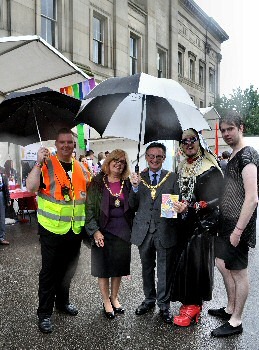 THIS years Liverpool Pride was held over Friday, 31 July to Sunday, 2 August 2015. This was the event's 6th consecutive year after being set up in 2010 in remembrance of Michael Causer, the gay teenager, from Whiston, who was murdered in a homophobic attack in Liverpool City Centre. 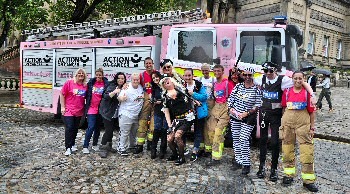 The aim of this event is to stop homophobia and transphobia in Merseyside and Halton and as a result it's man charity is the Michael Causer Foundation. But we are also told that it is also for the LGBT community to have some fun. 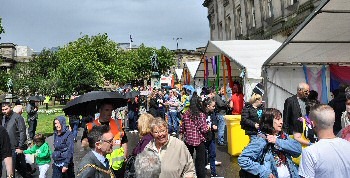 The event was on a smaller scale to last year, but was still well attended, despite the rain. Sadly we missed the parade on the Saturday, but we did get to see St John's Gardens, LGBT market, games and information area. Sadly the rain stopped the planned mass Pride Pink Picnic from running. Inside Central Library, on the rooftop, the VIP aria had a the winning children's pictures, that had been drawn by local children in and around Liverpool, that had then been used for this years event T-Shirts. Also students from Hugh Baird College gave out complimentary drink and canap�s to guests. 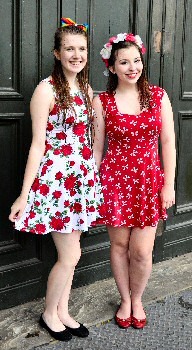 To see our photographs taken at the event on the Saturday, please click on here now. Also we are told that the Vigil held on the for Michael was also well attended. 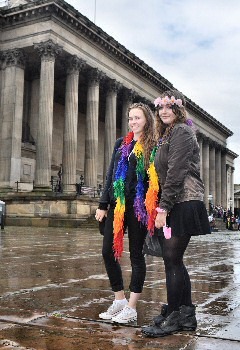 The Liverpool Pride said that:- "What a weekend! It might have been smaller than last year, but throughout the proceedings, it just got better and better. We would like to say a massive Thank you to all who braved the rain and attended throughout the weekend, in St John's Gardens, as well as at Bluecoat and the Vigil. We hope that people enjoyed the 'Love Is No Crime' theme, but also took on it's meaning. Please check out our website and follow us on both Facebook and Twitter, for more information about 2016's events. People can also register to volunteer or find out about sponsorship opportunities our website as well." To see more of these photos in this edition, please click on here now.